Is anyone here excited for Christmas? I know I am! Sadly, this year's Christmas might be a little different and maybe less jolly than the previous years. Philippines was hit by a huge typhoon killing thousands of people and leaving other thousands homeless. Nevertheless, life is about moving on and taking each day one day at a time. I know, little by little things will be okay and time will heal all wounds. On a lighter note, I decided to film more makeup videos since this is the time of they ear where everyone gets together and celebrate. 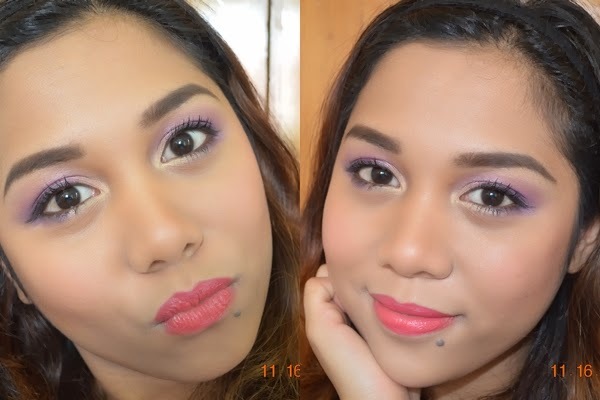 I created this particular look because I just love purple on brown eyes. I have brown eyes so I know for a fact the purple really compliments the color of my eyes. I used just a bit of blush to bring color to my cheeks and a pink/peach lipcolor. At first, I thought it will look to overwhelming to pair dramatic eyes and colored lips but I think they both looked nice together. I did not use too much blush so my face still looked fresh and put together. Thank you very much for taking the time to watch my video. In case, you do not know, Philippines was recently struck by one of the strongest typhoon ever. There were thousands dead and homeless. Water, food and medicine is scarce. If you would like to help, Red Cross has a way for concerned citizens like to you to donate any amount through Paypal. Any money you give will be used to give aid to these people. Just choose "SuperTyphoon Yolanda" on the campaign section. Thank you very much! Another amazing makeup of yours. It's always a pleasure to watch your photos because you always look great. Love this look! It's really pretty and soft - love it! Very nice. :) I love the colors you used for the look. You look stunning babe!! I like those purple shadow on you and your skin is soo good! I'm so happy that purple is well-loved this holiday and this look is no exception. It is such a pretty color and it compliments almost every skin tone. You look beautiful hun! What a really sweet make up!